Hunting for a job is rarely an easy process. There are many hurdles to jump over. Just getting your foot in the door of a company may seem almost impossible. However, if you put together a polished and professional resume, it can open many doors. Hiring managers look to your resume to learn more about you and see if you are a good fit for the job. If you do not create a resume that speaks clearly, you could very well loose out. When designing your resume, it is ideal to tailor it to the employer. British resume templates allow you to do this easily. Use them for guidance on what to include and how to present information. A template can make it a snap to write up a resume that is impressive and gets noticed by those who can offer you a job. Why Use British Resume Templates? You may not know exactly where to start when writing your resume. This is not an uncommon issue. If you are embarking upon a major job search, you may be quite nervous about writing this important document that could make or break you when it comes to grabbing a hiring manager’s attention. If you are trying to secure a job in a field where modern thinking is critical, then using modern British resume templates for your resume is a good choice. 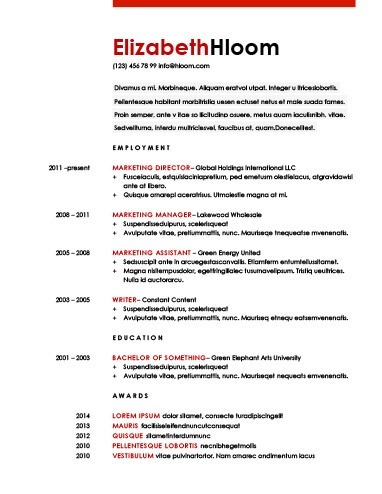 While this resume style has touches of creativity, it is more focused on a streamlined design. It also hints at traditional styles with a bit of elegance mixed in. A cover letter is often a smart idea to include with your resume. The cover letter gives you a chance to include personal and in-depth information that may not stand out or fit in your resume. In addition, it gives you more of a chance to introduce yourself to the hiring manager and make your case for why they should hire you. Classic British resume templates include all the expected information in the traditional style. This is a familiar look that hiring managers who have been looking at multiple resumes hour after hour truly appreciate. A classic style may not stand out, but it does impress because it allows for easy scanning by the hiring manager. If you are seeking your first job, then you should use an entry-level template. These entry-level British resume templates offer assistance with what you should include. Because you may lack experience, this template shows how to present other experience you may have to fill in the gaps. It is a tool that can guide you through the challenges of writing a resume with limited information. The most popular British resume templates are those that get the best reactions from hiring managers. These managers want to see easy to read resumes with the most important information front and center. This makes their job much easier because they do not have to read word for word to get to the main points. You always want to include your contact information at the top of the resume where it is easily found. Make sure to double check everything for accuracy. The last thing you want is for a hiring manager to be unable to contact you and offer you the job. Include your name, phone number, email, and address. You may also want to include your website if it is relevant. The summary or objective statement starts off your resume with a strong and engaging explanation about why you are the best fit for the job. In three sentences or bullet points, you should provide information on how you suit the employer’s needs. Explain your background and stress important skills. Present a list of your most relevant and useful skills in bullet format. Try to use some of the exact words used in the employer’s job description. Keep each point brief yet descriptive. Avoid any general terms or skills that pretty much everyone has. Focus on the unique skills. The work experience section of your resume will be its heart. Here contains the detailed information a hiring manager needs to know if you really are right for the job. You want to provide a look at what you did in past positions while also sharing accomplishments or things that made you stand out. Be sure to showcase how you benefited each company. The education section is typically brief unless you work in a field where education is of the utmost importance. Generally, you should list your most recent education, providing the school name, year, and degree. You do not need to list high school if you have a degree. Sometimes British resume templates do not work for everyone. You may feel as if you don’t know where to begin or that you just need a little more help. If that is the case, then you should consider using a resume builder. This is a resume building tool that allows you to provide information about yourself and then creates the actual resume for you.